I used to fly to Germany a lot and this is a very typical view from the aeroplane window coming in to land. 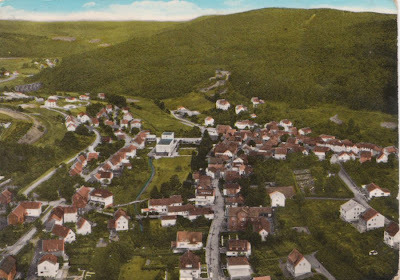 It shows the village of Entbach- possibly in the 1960s. Entbach is now part of larger grouping although not much changed. Various villages have been amalgamated since 1971 and now go under the name of Bad Entbach.